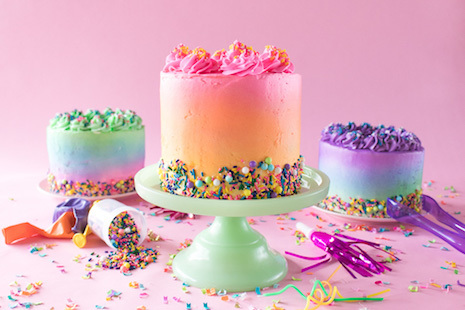 Continuing the celebration with these colorful gradient cakes! Continuing with the celebration this week, I have a fun, simple cake project for celebrating every occasion. 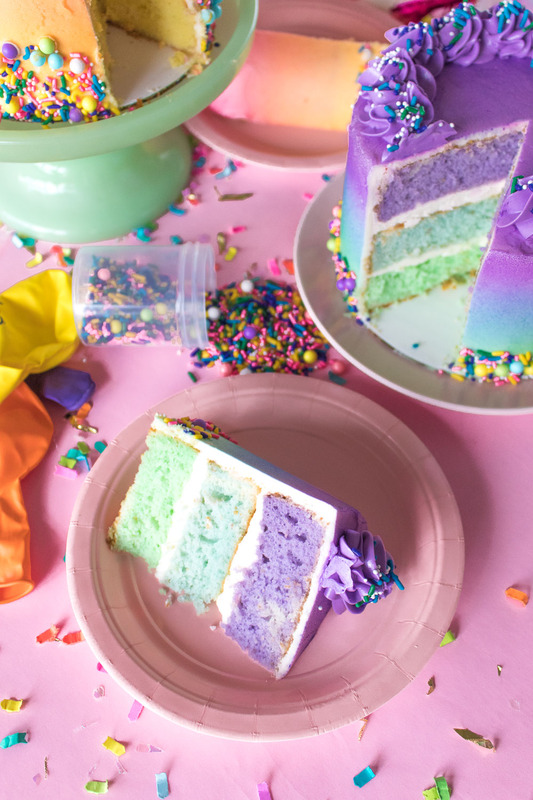 We’re so excited to show off our new brand colors that we wanted to incorporate them into cakes! 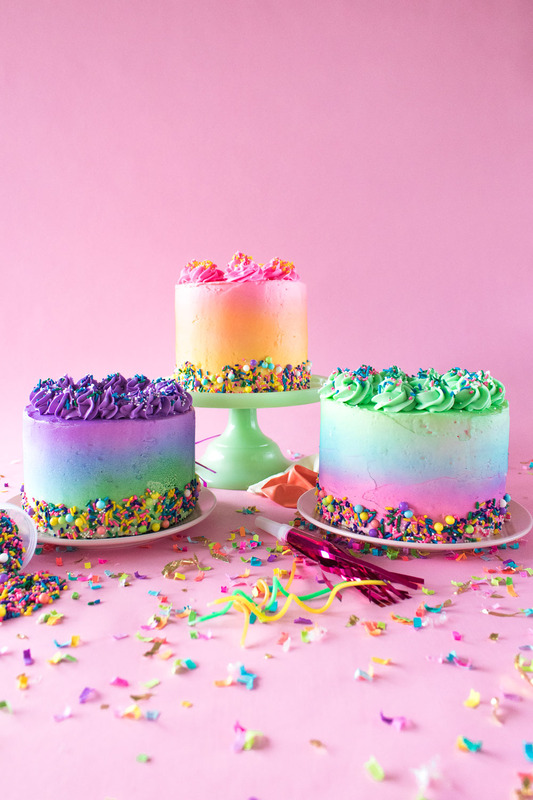 These simple gradient cakes are easier to make than you think – no tinted buttercream required! 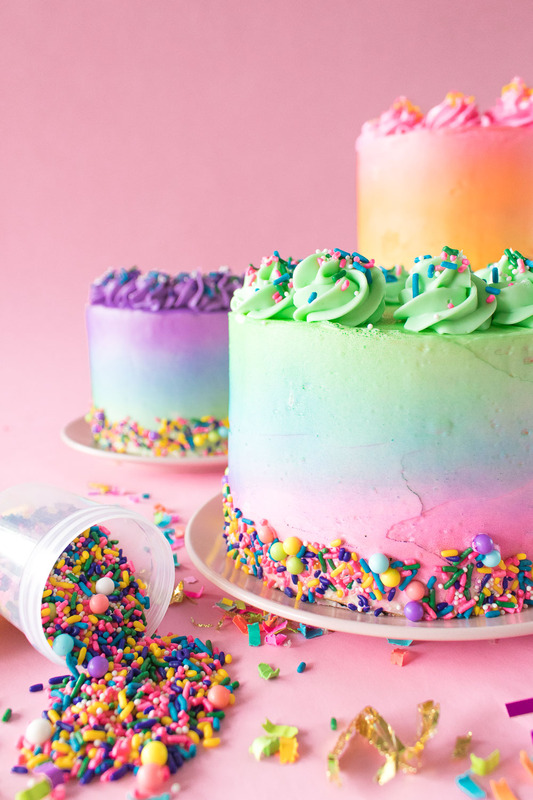 These gradient cakes, as opposed to ombre cakes, have three different colors that blend together to create a mini rainbow. Use your favorite color combinations or choose colors that complement each other well, like this pink, orange, and yellow combo. 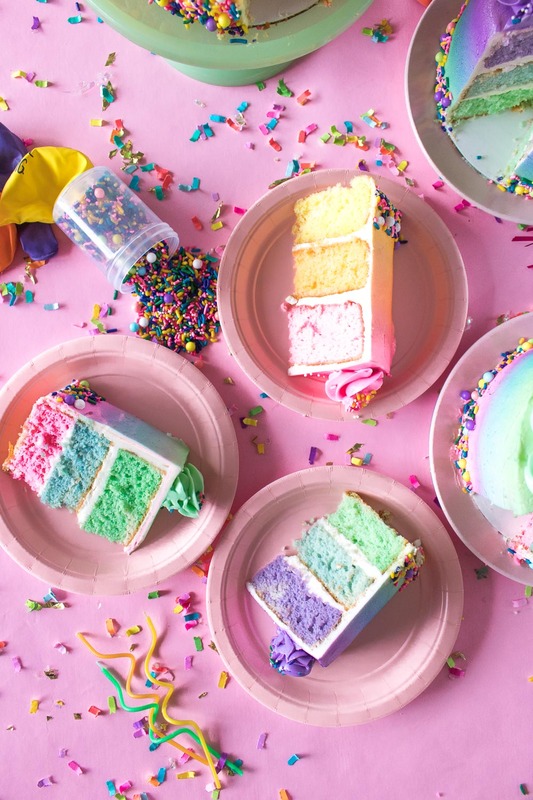 So what’s the key to making a gradient cake? Edible color spray! You can purchase edible color spray in many colors, and it works just like standard spray paint but is entirely edible. Want to take it up a notch? 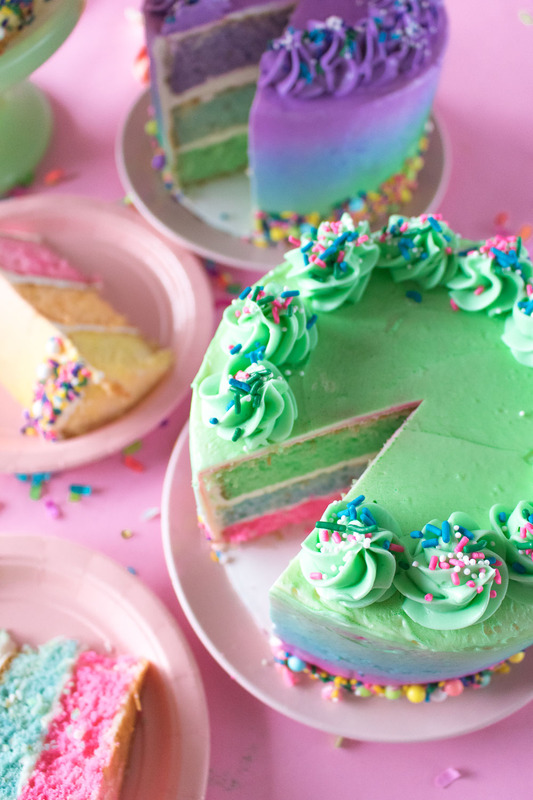 Make the layers inside match the colors outside by dying the cake batter your desired colors with food coloring before baking. 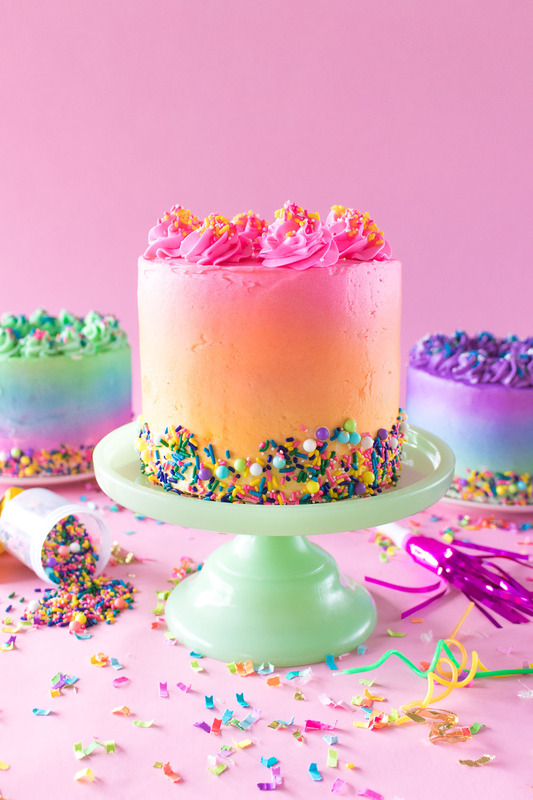 Here’s how to make your own gradient cakes, so you can celebrate with us! Place a 3-layer cake on a cake board and ice with buttercream using the angled spatula. First, apply a crumb coat and refrigerate for at least one hour before applying another layer of buttercream. Refrigerate for at least one more hour until the buttercream is firm. Place the cake on a turntable cake stand if possible, and be sure you’re in a well-ventilated area – outside is best. 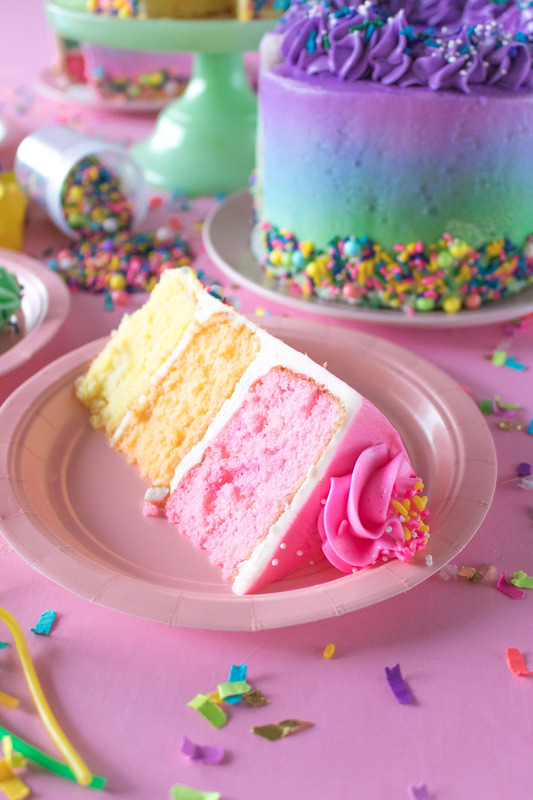 Starting with the color you want on the BOTTOM of the cake, vigorously shake the can and spray along the bottom third of the cake from about 12 inches away. Remember, you can always add more, but you can’t remove it! Start with a light layer and you can always add to it. Repeat with the second color in the middle of the cake. This will probably be the thinnest layer. Overlap very lightly with the layer you’ve already colored. 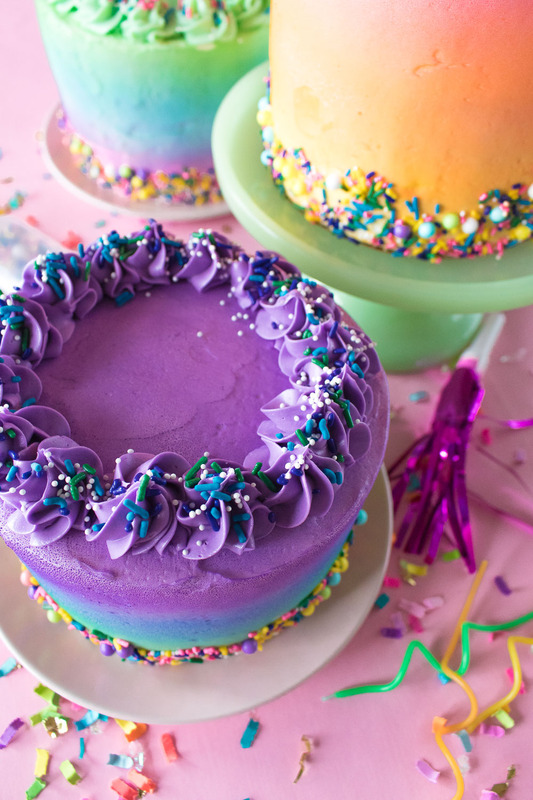 Repeat with the last color on the top of the cake and overlap slightly with the color below it. Then spray additional color as needed to fill in empty areas or darken the color. Warning: if you spray too heavily in one area, it may develop an unsightly texture, so go slow. 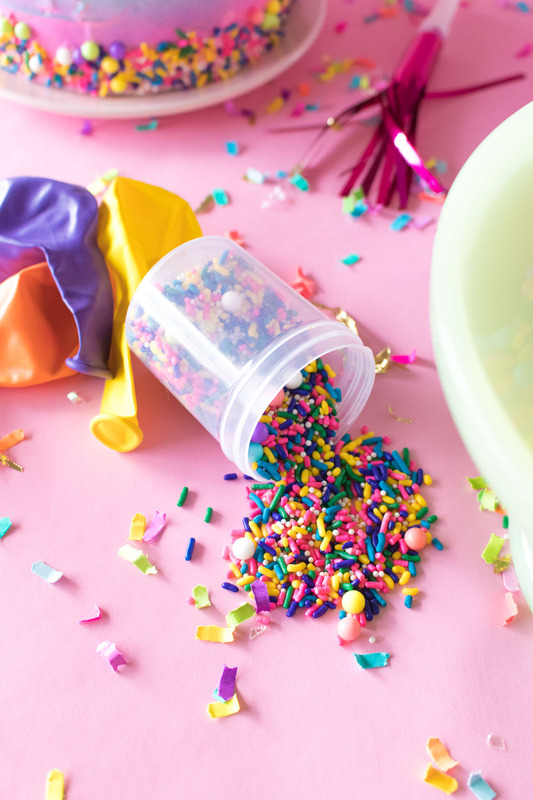 Use a damp paper towel to wipe away any stray color on your countertop or cake stand. As long as it is removed promptly, it should not be difficult to clean up. 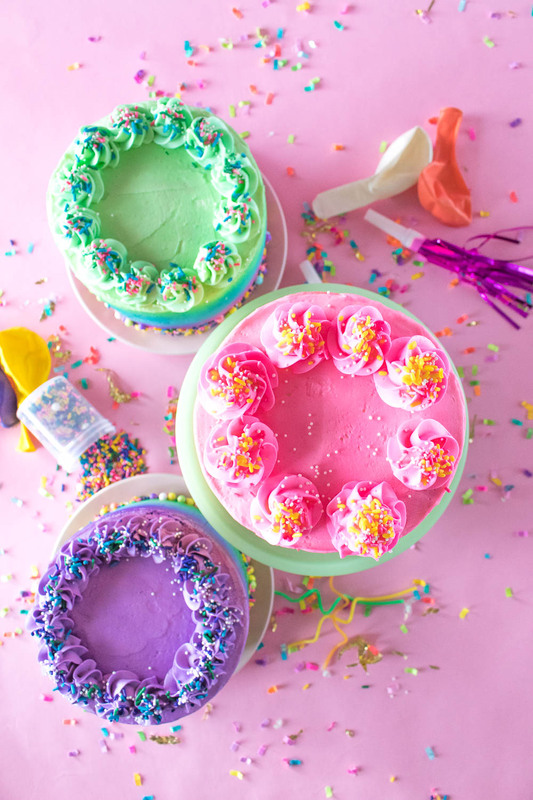 If desired, press sprinkles around the base of the cake and pipe dollops of frosting around the top of the cake for decoration. Refrigerate the cake until ready to serve. The color will last perfectly, but keep in mind that touching the outside of the cake WILL cause the color to smudge. How delicious do Holly’s celebratory gradient cakes look? Almost too pretty to eat! The key word there being almost. We hope you’ve been enjoying our new site and shop. Be sure to let us know what you think in the comments below. As well, don’t forget every single day of the week we’ll be bringing you two new pieces of content. Along with the daily article, there is also a daily look, which you can always find on the homepage and on our looks page. Continuing the celebration with this colorfully, delicious recipe.